Gadgetzz was at CeBit this year, nothing much new but we found a few exiting things so click more for some pictures! 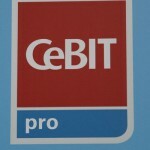 CeBIT (German: for Centrum für Büroautomation, Informationstechnologie und Telekommunikation, lit. “Center for Office Automation, Information Technology and Telecommunication“) is the world’s largest and most international computer expo. CeBIT is held each year on the world’s largest fairground in Hanover, Germany, and is a barometer of the state of the art in information technology. The trade fair is organized by Deutsche Messe AG. With an exhibition area of roughly 450,000 m² (5 million ft²) and up to 850,000 visitors at the apex of the dot-com boom, it is larger both in area and attendance than its Asian counterpart COMPUTEX and the no-longer held American equivalent COMDEX. While by 2007 the CeBIT expo attendance had shrunk to around 200,000 from those all-time highs, attendance rebounded to 334,000 by 2010. The 2008 expo was marred by the police raids of 51 exhibitors for patent infringement. The 2012 expo was held from 6 to 10 March, 2012.